If you are a savvy business owner looking to increase website conversion, an integrated, authentic social media strategy is imperative to achieving the results that you desire. The right social media strategy will allow you to share who you are with potential customers in an authentic and powerful way. Loyalty and trust play a big part in increasing website conversion. When what you share on your blog, Facebook and Twitter truly represents you, people feel safe and more likely to move from interested bystanders to converted visitors. So simply tell your story throughout your social media channels (both the good and the bad). Be authentic. Social media channels can be used to bring relevant visitors to your website – visitors who will convert into customers. This can be done through messages of invitation via your social networks. Essentially you send out links inviting the visitor to come and check out who you are and what you have to offer. Creating engaging blog content and sending out messages via your social media channels that asks readers to engage with the content is less of a “hard sell,” a more indirect method of bringing relevant customers to the site. Remember that Social Media doesn’t only connect you with prospective customers, it also connects your prospective customers together. This is the true power of social media. The best source of a new lead is a recently-satisfied convert from your website. Website visitors who have enjoyed what you have to offer can be encouraged to share their experiences with their friends. You want them to be your brand evangelists. By offering them the immediate ability to share their conversion (purchase) with their friends via Facebook, Google+, Twitter, Pinterest etc., you can increase web traffic and bring relevant visitors to your website. In this way social media is acting like a referral service for your business. Note: It is also possible to incentivize your converting customers by offering them a special discount if they share their purchase on your website with their friends. If your website is correctly optimized for organic search, then search traffic can contribute a significant number of converting customers. Social Media now plays an increasingly important role in the SEO of any website. Major search engines like Google are using our social media profiles (how we connect with others) to personalize our search results. So building up your Google+ profile, and growing your Twitter and Facebook followings are going to affect the number of people who visit your site through the relevant search terms. Social Media can also provide you with additional SEO benefits by building links to your website and raising your profile within search engines. To solely rely on search traffic to increase website conversion would be foolish. Your Social Media and SEO strategies need to be integrated and implemented together. Paid Advertising on social media channels is another great way to increase website conversion. In particular the advertising on either Facebook or LinkedIn allows you to drill down and target your customer demographics with incredible accuracy. When you use Social Media to genuinely and authentically express who you are, you will by proxy attract people who are just like you, people who are most likely interested in your brand. 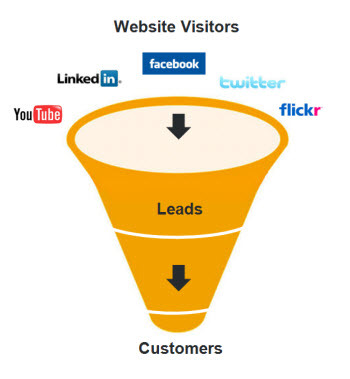 These types of visitors increase website conversion.